Mensusa https://www.mensusa.com/articles/flaunt-your-dignity-with-ostrich-skin-wallet.html Flaunt Your Dignity With Ostrich Skin Wallet Stylish men are conscious about each and every aspect of their attire starting from the dress shirts, suits, as well as accessories like their ties, shoes, belts as well as wallets. Among the different types of wallets that are used by men exotic skin wallets are the first choice of sophisticated men. 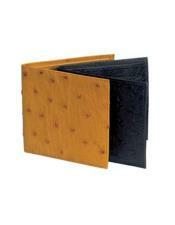 The ostrich skin wallet stands out among all others in style and elegance. A wallet is one of the most important accessories of a man. He carries it with him wherever he goes as it carries all his important papers and money as well. Hence he chooses a wallet that is strong, durable and versatile. Most men use leather wallets as they have an attractive look. But those men who are extremely style conscious and hold high positions, select exotic leather wallets to portray their status and sophistication. The ostrich skin wallet helps him to achieve his ends in this respect. A man who purchases an ostrich skin wallet takes great pride in showing off his exclusive wallet to everyone. But he cannot just display it but often takes it out from his pocket as if to take out something from it. This draws the attention of all men who are aware of these exotic items and know how costly they are. An owner of the ostrich skin wallet is envied by all around him. The luxurious look of the wallets made of ostrich skin makes it so alluring. The designers maintain the original appearance of the ostrich skin while using innovative ideas to make the wallets extremely versatile. MensUSA is the ideal place to purchase such exotic leather products. It has an amazing collection of wallets, belts, as well as shoes of ostrich skin. The wallet is available in a variety of designs and sizes to fit into your pockets. You will get different number of folds like the double fold and the triple folds. There are numerous pockets too in the ostrich skin wallet so that the user can store his cards, money and even bills and important pieces of paper that he needs to carry with him all the time. ostrich skin is extremely soft but sturdy. The professionals take great care to craft the wallets from ostrich skin which is not readily available like other kinds of leather. Hence these wallets are quite expensive and unique. They are hand-crafted and so each and every piece is a work of art. At MensuSA you will get authentic ostrich skin wallet and even if you ask for a second one of the same kind, you will never get another. 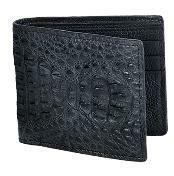 It is for this reason also some men use these wallets to show off their uniqueness and distinct style. 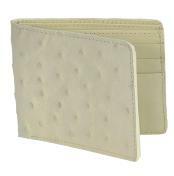 If you wish to own an ostrich skin wallet, visit the store to pick out the one that appeals to you the most and suits your budget also. Try to grab these exotic wallets when they are offered at discounted prices during special occasions. It is the uniqueness of the ostrich skin wallet that matters the most and not its price.